By Sam Smith | 4.11.2016 | 4:25 p.m. So how the heck did it happen? That will be the question asked in various ways with sundry responses over the next several months with the Bulls Sunday eliminated from the NBA playoffs with Indiana’s victory over the Nets. 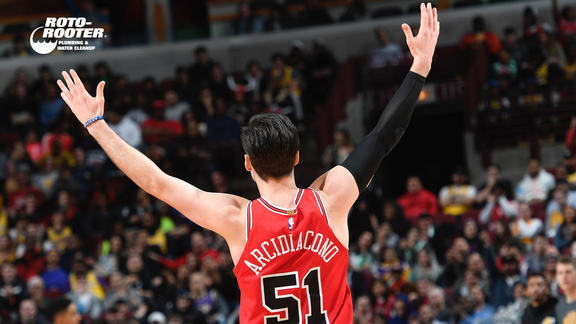 The Bulls, 40-40 after the last good moment of the season with Saturday’s win over the Cleveland Cavaliers, now play out the last two games against New Orleans and Philadelphia asking why, how and what’s next. No one really believed this was a championship contending Bulls team with essentially the same team that lost in six games in the conference semifinals to the Cavaliers with two of their three best players out. But no one—and you won’t find one national preseason prediction to declare it—believed this Bulls team, especially with Derrick Rose about to play his most games in four years, would not be in the playoffs. The national consensus was the Bulls were a top four team in the Eastern Conference with perhaps the best chance, assuming anyone can, to upset the Cavaliers and LeBron James on the way to another Finals appearance. It’s a sudden and precipitous drop from there to not being one of the top eight teams in the Eastern Conference. Yes, that conference. So how and why did it happen? There’s plenty of time for what’s next in the upcoming months starting with the team’s first trip to the draft lottery since 2008, when they caught the magic ring and jumped to the No. 1 pick and Derrick Rose. There will be much speculation, accusation and ersatz illumination about how it all happened, and there’ll be truths buried in all of those that make sense. Though it was more a combination of unfortunate and unintended forces, a perfect storm, if you will, of confusion, lack of coordination and just bad luck that left the Bulls scratching at the playoff window. The most popular theory of late has been the high school sweetheart lament of if only we had kept the former coach, Tom Thibodeau. It’s sentimental, if likely out of bounds, since Thibodeau even with all his charts didn’t have the ability to magically heal. Plus, his time naturally had been exhausted. It was an inevitability of irreconcilable differences. It happens with all coaches. Thibodeau already was in the top five in league coaching seniority with five years. It’s not a long term operation, and despite the hope, this Bulls team had essentially been together since Rose’s arrival in 2008. It was concluding the natural life cycle of a team with veterans like Pau Gasol, Joakim Noah, Taj Gibson, Mike Dunleavy, Rose, Aaron Brooks, Jimmy Butler. It was being given an opportunity to ride it down with some success. The fall was much more precipitous than expected. So now they know they are done. They didn’t know before, and no one on the sidelines was changing that. Coach Fred Hoiberg, essentially, was being brought in to guide the transition as much as anything, a new coach with new ideas. The old players didn’t take to them as well, which happens. They had five years of habits to break which they couldn’t or wouldn’t. So blame comes to the coach, always too much when the team loses and too much credit when it wins. Consider Brad Stevens coming to the Boston Celtics from college. His team won 25 games its first season and the talk among players was he ran college sets and was unsophisticated. The Celtics knew to give him a six-year contract, and now in his third season, and first with a team playing above .500, he is regarded as one of the best young coaches in the game. New coaches need time. Sometimes they walk into Rose on the way to being MVP; other times they walk into Rose trying to avoid a fourth knee surgery. So perhaps that’s when it really began to go bad. Rose was almost euphoric, albeit with the media petulance over his vague comments about free agency, about starting a season, finally, without going through a summer of knee rehabilitation. Rose suffered a facial fracture in the first scrimmage, basically putting him out the entire training camp. Despite the specious narrative he was saving himself, he insisted on making the season opener. He’d initially wear a mask for protection, and would go at least a month playing with double vision. It’s hardly coincidental his shooting was among the worst in the league then and improved every month this season to more than 40 percent on threes in March. But valuable time to get a jump on the league was lost as the Bulls schedule was softer the first half with more home games. Perhaps Hoiberg erred in moving Noah to the bench, which Noah lamented. But what was the choice? It was obvious from last season’s play he and Gasol could not start together and Noah said he felt more comfortable playing center, and playing with Gibson. That led to Hoiberg assuming Noah was fine with his bench role, which produced another kerfuffle about starters. It’s standard to start the older veteran as they have trouble warming up, sitting and them coming in. Few teams do that, and Noah’s offensive game had regressed. Hoiberg was trying to inject more velocity and offense into the Bulls game to match the league’s evolution. It wasn’t an indictment on Thibodeau as much as adjusting to the changes, especially with a team leaning more toward offensive players. And the defense was adequate the first half of the season, essentially ranking among the top 10 in defensive field goal percentage until Noah went out for the season. The injuries will be mentioned, and they were significant, more player games lost than any time in more than a decade. Butler went out for a month and took weeks to get right again. Nikola Mirotic, who was a starter opening the season, missed almost six weeks with appendix surgery. Dunleavy missed the first three months after back surgery. Gibson and E’Twaun Moore closed the season missing the last several weeks. It was yet another sign of a team that had its run and was hopeful in stitching things together for another season. When the Indiana Pacers lost Paul George last year, they missed the playoffs. Same with the Oklahoma City Thunder and Kevin Durant. You just don’t replace pivotal starting players and succeed going to your third team and starting your second. The Bulls had a reasonable start, but there were concerning signs, though it also was a repeat of 2014-15 when they lost those games to “bad” teams that became a source of confusion. They lost to Detroit and Charlotte early, but we learned they were better teams than everyone thought. Both have made strong playoff runs. No one is making the playoffs this season at .500 or under in the East. The Bulls were 9-4, lost at Indiana, at Boston; again better teams than predicted. They were a solid 15-8 and in the national power rankings as a top four East team with the first crisis. The next night the Bulls showed up in New York—they got better, too--and lost badly. Butler, like most everyone, cranky and on edge from the discouraging loss, late flight and early game in New York, questioned Hoiberg after the game, drawing national headlines and a rebuke. The Bulls went on to lose three straight. But then with a bunch of soul searching meetings they seemed to pull out of it with an impressive Christmas Day win over the Thunder to sweep them for the season, a loss in the second of a back to back in Dallas against also a better than predicted team, and then six straight wins, including over contending Boston, Indiana and Toronto. But Butler also had undercut his desire to be a team leader with his outburst, in part a product of the events of the previous game and the frustrating loss. Sometimes people overreact and make mistakes. Others never let them forget. The Bulls were 22-12, the defense was highly ranked, and the general national agreement was Cavs, but the Bulls could pose a problem. But the problems began in earnest then and they would be too great to overcome. Noah had gone out with a shoulder injury Dec. 21, returned after missing nine games, played in four and then was gone for the season Jan. 15 for surgery. Noah had struggled with his offensive game, but he played a much bigger intangible role. Even though he wasn’t starting, the shadow of his presence hung over Gasol and incited his defense. After all, Noah could finish. Gasol, though having a strong offensive season, wasn’t as naturally aggressive as he had to conserve himself more for bigger minutes with Noah gone. It wasn’t until just recently that Cristiano Felicio began to bring unexpected results at center. Perhaps more importantly but less seen was Noah’s locker room influence. There was much speculation and accusation about an alleged rift between Rose and Butler. They got along fine, though their games often didn’t mesh because both liked to control the ball and make plays. Butler, probably, is more equipped to be a small forward. He plays shooting guard because the Bulls don’t have one of those and have several small forwards. But Butler is one of the league’s poorest shooting guards at 30.7 percent on threes. Both Rose and Butler tend to stay to themselves, not outgoing with teammates. Even when the team had a meeting after discouraging losses in March, it took Noah, who mostly was watching because he was out, to stand up and take charge of the meeting with few contributing. Noah didn’t travel and wasn’t even with the team doing rehabilitation, and no one was able to fill the void among the players. The notion is that becomes the coach’s job, but the coach only has so much voice as an outsider who gives orders and direction. Thibodeau had Noah inside the locker room; no one did this season. The Bulls began to stumble. Butler, however, was so good he began to bail them out with brilliant individual games like 53 points against the 76ers and a 40-point half against Toronto that may have been a season highlight of sorts with teammates mobbing him at the finish. The Bulls were still in relatively good shape at 26-19 starting the Western Conference trip of doom in late January. They lost Butler to a knee injury, and it would be six or seven weeks before he was right again. Then as they were down, and this with Mirortic about to go out as well, they blew late leads and turned what seemed like sure wins into five straight losses to end the trip and go into the All-Star break. They were 27-25 and now trying to patch it together. Rose missed five of 10 games after the All-Star break with Butler out. Gibson had long replaced Mirotic as a starter to boost the forward defense, but that starting group would get six games together all season. The Bulls would use 23 different starting combinations. They went on a late February trip depleted and were hammered in Atlanta and Miami, came back and got some good wins, over Houston, Toronto, at Indiana and to about close the season over the Cavaliers, the Bulls 7-1 against the top two East teams. Not so good otherwise. Tony Snell given 32 starts continued to regress to the point he fell out of the rotation and probably future plans. The Bulls had hoped he would be that athletic wing player like former teammate Kawhi Leonard, to whom he’d been once compared. Bobby Portis encountered rookie blues and couldn’t crack a regular rotation, and then Dunleavy suffered a virus that badly weakened him in mid-March and he had trouble recovering. The effective end was late March with back to back losses to the sliding Knicks and blown out in Orlando. The Bulls showed some pride and resolve winning road games in Houston and Indiana. But it all had become too much, it seemed, the personnel and coaching changes, the injuries, the years together with ultimate disappointment. They didn’t turn on one another as much as taking a breath and being unable to gather themselves. The dilemma is where it goes now.